These are our current classes, but we are adding new dates all the time due to demand so please keep checking back. Or if you have a date in mind, just email us & if we get 6 or more people we will put a class on for you! 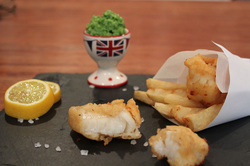 Learn to cook a traditional British 3 course meal. A delicious starter of caramelised shallot tart with English leaf salad & mustard dressing, followed by beer-battered fish & chips, rounded off with rhubarb crumble with vanilla bean custard. It doesn't get any more British than this! You will learn all the steps in how all this delicious food is prepared and cooked from the raw ingredients, see how it can be stylishly presented, before sitting down to enjoy it in the spacious dining room. Follow the story from the toil of the kitchen to the pleasure of savouring the delights that arrive on your table. A tasty and fun night out, kicked off with a complimentary glass of Pimms! 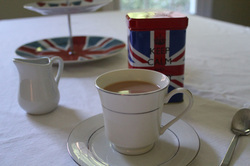 The traditional British high tea is a splendid way to while away an afternoon. Learn to make finger sandwiches, scones, home-made jam and a selection of miniature cakes worthy of one of the Queen's garden parties. Then sit down to enjoy this feast and more with a complimentary glass of champagne and lashings of tea. It will transport you back in time to a Jane Austen novel, although we can't promise you Mr Darcy! Rhubarb Kitchen can offer a creative and innovative solution to any social occasion that you are planning. We love a challenge and pride ourselves on our creativity and resourcefulness and so would be delighted to work with you to create a menu and format that perfectly suits the occasion - this may be a cookery class, afternoon tea, a full dinner party or a drinks reception with finger foods, with the main goal being that you can relax and enjoy having the food prepared for you. We also host childrens birthday parties such as Princess Kate Afternoon Tea Parties. So, if you are looking for a unique party that is perfectly tailored to your needs, whether it be for team-building or a celebration for work, for birthday, engagement, bridal shower, baby shower or any other excuse for having fun and relaxing then please contact us with your requests and we will be very happy to work with you to design a menu and party to be remembered. We would be delighted to host this or else we can come to you and help you to take the stress out of hosting your own party and give you the restaurant experience in your own kitchen - and we'll even let you take the credit for the wonderful food that will be exquisitely prepared and served to your guests! Please contact Becs or Lisa for more details. Rhubarb Kitchen cooking classes are the perfect gift for a friend, family, co-worker, or anyone you know who likes to cook or wants to learn. With a gift certificate you give them the freedom to choose their own class, while still giving a thoughtful present that will be remembered for years to come. * Cancellation Policy - If you cancel within 48 hours of the class, tuition is non-refundable. However, you may send a friend in your place and request that the recipes be mailed to you. * Classes need a minimum of 5 people to run. In the event that there are less than 5 people you will be informed at least 48 hours before the class start time and offered an alternative class or a full refund.